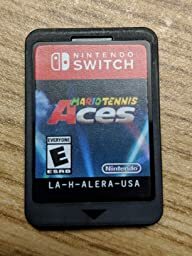 Mario Tennis Aces is a new Mario tennis game is bringing a new level of skill and competition to the Nintendo Switch system. Mario steps onto the court in classy tennis garb for intense rallies against a variety of characters in full-blown tennis battles. 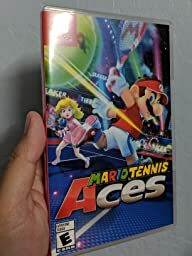 Best Mario Tennis hands down in the entire series in terms of gameplay; and way better than the horrible Mario Tennis: Ultra Smash on the WiiU. There are 15+ Playable Characters making it the largest roster in any Mario Tennis game. -Zone Speed. when activated puts you in slow motion or bullet time. -Special Shot. You can save up your meter till it’s full to initiate special shot. This can destroy enemy racket in one hit (instead of 3 like in zone shot), but again, if timed correctly your opponent can block it. -Trick shot. Makes you leap/dash to one side of the court while also helping you build meter faster than normal shots. Charge shots also build up meter, but not as fast. -Court Hazards. There are also court hazards such as teleport portal mirrors, random bombs on court, and piranha plants on net to name a few. You can also toggle this off if you want. -Simple Rules. You can turn off all abilities and play a simple game of tennis with just basic shots, and no racket durability… but it’s not as fun in my opinion. -Swing Mode. You can use full motion controls like Wii Sports Tennis if you like, but it’s not as efficient/effective as traditional controls. Great for casual play among friends and family, or if you want to work up a sweat/get off the couch. 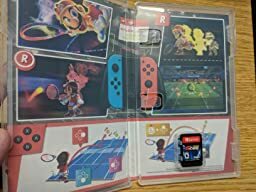 Unlike Mario Tennis: Ultra Smash you can play with your friends online. Gives you fun mini-games, and scenarios/objectives to play through especially with the boss battles. Plot is very simple like most Mario games: Wario and Waluigi finds an ancient tennis racket which turns the holder of that racket evil. Luigi, being the curious guy he is, touches it and it’s a mad dash to get 5 stones to reverse the curse. After playing this game for several hours over the last few days, I can say that this game is very fun and has proven to be worth the initial purchase price. For everyone, the worth of the game will be different in terms of what one hopes to get out of it. I actually played this game in a party-type setting with friends, and that is where this game shines the most. All of us were pretty unimpressed with story mode. One of my friends, who also owns this game, said that the gaming press was inaccurately reflecting the difficulty of some sections (according to him it’s easy as pie), while another friend found the whole story mode/gameplay in general to be frustratingly hard. I find myself falling right in the middle, with a little leniency toward the difficulty not being something insurmountable. We found that when we focused on just playing against one another, that was where most of our time went. We had an absolute blast when playing against other people in the room and against people online. Platinum’s Hideki Kamiya rules out Resident Evil 2 remake but admits: ‘I would love to work with Capcom again’.